Isabel Spellman may have a checkered past littered with romantic mistakes, excessive drinking, and creative vandalism - but she's good at her job as a licensed P.I. with her family's firm, Spellman Investigations. Invading people's privacy comes naturally to Izzy and all the Spellmans. If only they could leave their work at the office. Izzy walks an indistinguishable line between Spellman family member and Spellman employee. But when Izzy decides to get out of the family business in search of normalcy, she ends up taking on the most important case of her life. The Spellman Files is an unforgettable introduction to the Spellman family in all its lovable chaos. I love this book and this version of the audiobook (unabridged narrated by Christina Moore) is THE version to get. The other narrator isn't bad but Moore captures the snark amazingly well. I had first heard this from my local library and was frustrated that I was unable to purchase it until now. I had purchased book 3 in the series and just couldn't get into the narration so was thrilled to find book 4 narrated by Moore. I have already listened to this version twice since purchasing (and if I hadn't had a credit available I would have purchased it outright my need for this version is that great). The book itself is a wonderful storyline reminding me of a Stephanie Plum distant relative. The book treads into the mystery genre while wallowing in the comedy and dips a toe into the romance arena. I hear its being made into a tv series and I cannot wait! For the first hour and a half getting to know the Spellmans was fun, but at the three hour mark I had to speed things up. At the very end it dawns that without the painful lists, meticulous character descriptions, and seemingly random anecdotes, it wouldn't be so touching. The best way to describe this wacky bunch is if you took the spook out of the Addams Family and gave them all PI badges. PS - The narration is not bad, but in no way matches the main character. Would you listen to Spellman Files again? Why? I have read (print version) the Spellman Files in the past and enjoy the second book even more than the first. I thought the narrator portrayed the characters well and the story was still a fun listen. What other book might you compare Spellman Files to and why? If you like the Janet Evanovich Stephanie Plum series you might enjoy Spellman Files. It has that same feel of a character who gets herself into comedic situations as she is trying to solve cases. Although I thought Rae's voice sounded younger than I imagined, I thought her tone and humor were done really well. I definitely found myself laughing at points. 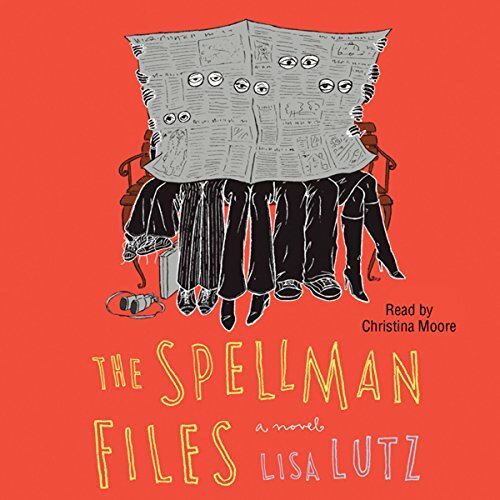 Where does Spellman Files rank among all the audiobooks you’ve listened to so far? This is a wonderfully done audiobook. The story is off beat, fun and funny. Love the characters and the family dynamics that the author explores. And at the same time it is a detective story- well a story about detectives investigating a "crime" and then each other. She is brilliant and captures the nuances of the voices so beautifully that you really feel each character. What a great actor!! I laughed and teared up. It held my attention so deeply that the time on my commute just flew by and I wanted more. I was disappointed when it was over- that is the sign of a great audiobook. Its OK to be a little different! A great mix of PI drama and family disfunctionality! If families like the Spellman's could teach us anything: it's that forgiveness goes hand in hand with responsibility and its OK to work in your family's business but maybe stay out of your family's business once in a while... The performance was ideal and added color to a story that could stand on its own. Check it out! Wait! What happened to a promising story?? The beginning...what’s not to like? The protagonist is a snarky recovered juvenile delinquent, now 28, buried deep in a quirky family of PIs. Hilarious without being silly. The characters are flawed, infuriating, care deeply about each other and have a moral code of their own unlike any other. Then it flatlines. The characters don’t learn, don’t grow, and any change in character is for the worse. The plot, always secondary to the characters, stumbles along. The story becomes repetitive, then a little depressing, then just sad. I’ll look at another Spellman story with the a little hope—better?—after I’ve recovered from the disappointment. In the "Stephanie Plum" league to me and I've looked awhile for anything even close! Count me in for more. I needed another series to start and am glad that I found this one. It wasn't want I expected. It didn't keep me on the edge of my seat. But I liked the twist and turns of the plot. The Spellman Files is all about the characters, all of whom are depicted solidly. Lutz does an outstanding job of revealing the characters through dialogue and action as well as through the main character's slightly sarcastic observations. The Spellmans are a family of private investigators, and in the Spellman family, even the kids join the business starting at a very young age, which leads to its own set of very interesting problems. The main character is Isabel Spellman, and we see the world through her eyes as she works cases, survives her family, and attempts a social life outside the quirky, overbearing, and plain old nosey confines of the family business. The mysteries, which play second fiddle to the family dynamics of the Spellmans, are not all that mysterious; I found I had correctly guessed the outcomes of the biggest mysteries in the book without much effort. Still, Lutz had put enough twists in that I was interested enough to stay with it until the end, unsure if she would toss a surprise turn of events in for good measure. Fun, crazy story of a very dysfunctional private eye family. The story line was centered around the daughter having a boyfriend and how he thought they were a crazy family. This is a series. Might be fun to read a couple more in the series.